You'll like this car if you want to kick over the traces, knife through six manual gears, crank up the acceleration and enjoy a dose of sporty performance. If you like plenty of dials, gauges and leather-accented seats, you'll like the SE model. The speedy (but sensitive) Tiburon. The Hyundai Tiburon itself is great. The only annoyance I have with the car is the extremely sensitive turn signal. If you turn the wheel slightly the turn signal will shut off. Other than that, it is a great vehicle! Has a great acceleration rate. The gas mileage is a little disappointing, but I knew that buying the car. Overall takeaway: great fast little car. I would recommend to anyone looking for a little speed. Overall this is a great vehicle that needs only minimal upkeep. This is a great vehicle overall. It gets good gas mileage and rarely needs more than your basic maintenance. The back seat is very small and cramped, but that is to be expected of a small two door vehicle. The trunk is large and spacious, but the slanted rear window over it does limit your vertical space. So all around great vehicle and will give you nothing but satisfaction. All around great car! 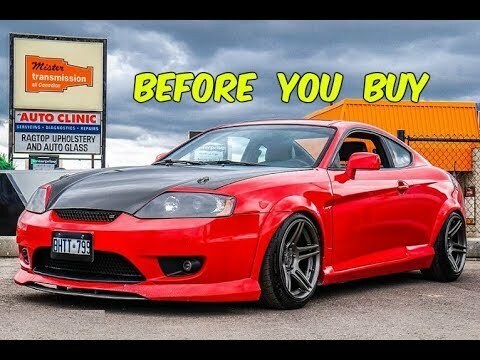 I have owned my Hyundai Tiburon for the past few years now and I have only had a few maintenance issues with it. Keep up on the maintenance and it will not let you down. It's very unique and will get a lot of compliments from people.